The Madagascan Tomato Frog is found only in Madagascar and there they are limited to the northwestern part of the island. Habitat - shallow pools, swamps and areas of slow-moving water. The Madagascan Tomato Frog is found only in Madagascar and there they are limited to the northwestern part of the island. Adults are fairly large as you can see from the dimensions provided above, sometimes as big as a person's fist. Now that is pretty large for a frog !! The interesting thing about Tomato Frogs is, that the male is quite a bit smaller then the female, actually about only one third in size compared to the female. Another interesting fact is that the male is not as bright in coloration as the female and is showing only a dull orange or brownish-orange instead of the reddish-orange found in females. As Juveniles, both the female and male Tomato Frog are dull in color and only develop their individual coloration as they mature and utilize this coloration as a warning mechanism. Would you approach someome you don't know, that is colored bright red and exudes a sticky white, irritating mucus. 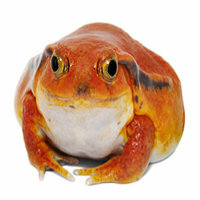 Endemic to Madagascar, tomato frogs are found in the northeast of the island around Antongil Bay (from which they gain their specific name, antongilii) , and south to Andevoranto . The exact distribution of this species is unclear however, due to confusion with the closely related D. guineti. Tomato frogs are just like other frogs. They love to soak mostly at night and they like to hide either in moss, substrate or their toad houses. They eat Calcium and vitamin D3 and vitamin dusted crickets and occasionally wax worms. Frogs are cold-blooded, meaning they can’t regulate their body temperature on their own. A heater is not usually necessary as these frogs are comfortable in room temperature, but if your home is cold you should consider a small heat light for extra warmth. These frogs like high humidity. You can help keep the humidity high by using a plant mister to spray the habitat with water once a day or more. Air conditioners lower the humidity of the room so if you have one on, you must give your frog’s habitat a few more sprays of water to make sure he doesn’t get dehydrated. Coconut Husk bedding is good to use because it helps to retain moisture in the habitat. Make sure the habitat is always clean. If you move the frog into another container to clean his habitat, gently lift him with your fingers being careful not to poke, pinch or squeeze him. You must also be very careful when you clean your Tomato Frog’s habitat. They are extremely sensitive to soaps and detergents. Using only hot water, rinse the habitat and décor. Remove dirty substrate bits or replace the entire substrate. Always wash your hands after handling the habitat contents. A 10-gallon aquarium can house two adult tomato frogs, but a larger terrarium is advisable to allow the frogs room to explore and distance themselves from each other if desired. Half-branch log tunnels, often for sale in pet stores, will provide a good hiding spot. Plants such as Pothos (devil’s ivy) can be included, but tomato frogs burrow, which may disturb plants and hamper their growth. Plastic plants are a good alternative. A shallow water dish containing dechlorinated water should be provided. Tomato frogs do well at temperatures between 65 and 80 degrees Fahrenheit. If the ambient temperature in your home falls below 65 degrees during the winter, a thermostatically controlled heat pad should be used beneath a section of your tomato frog terrarium. Keep track of temperatures, as those much higher than 80 degrees can result in the death of your tomato frogs. Humidity should be maintained by misting every one to three days. A glass lid with some ventilation will help keep humidity up; just be sure there is sufficient ventilation to prevent respiratory disorders from occurring in the tomato frogs. Two good substrates for a tomato frog terrarium are top soil or coconut fiber. Provide a depth of at least 2 inches because, as mentioned, tomato frogs are burrowers; they like to dig down into the substrate in order to ambush prey as it walks by. If using soil, be sure to avoid any that may have been treated with herbicides, pesticides or fertilizers. Replace the entire substrate every one or two months. These frogs need to eat 3 to 4 times a week. The Tomato Frogs are not particular on their food…if it moves and they can catch it, they will happily eat it. They do need movement to recognize food, so they will not eat dead food sources. Crickets, worms and other small creepy crawlies form the bulk of the frog’s diet. They have been known to eat small fish like guppies. They can recognize routine –if you feed them at the same time every day you’ll start to find them waiting for their lunch. Any uneaten prey should be removed from the enclosure the next day to prevent dead insects from polluting the frog’s environment. Every-other feeding we suggest you sprinkle a little calcium or multivitamin powder onto the bugs before you drop them into the habitat. The frogs were large enough to be sexed based on size and coloration differences, and potential breeding groups of four males and two females were established in two 122 cm x 61 cm x 61 cm terraria. Enclosure temperatures and photoperiod ranged seasonally from 21 to 26 C and 9.5 to 16 hours of daylight, respectively. Enclosures were also misted to maintain a relative humidity of 70 to 90%. Six months prior to planned breeding attempts, staff attempted to stimulate reproduction by maintaining the frogs at a drier relative humidity (55 to 65% average). This was accomplished by decreasing the pool depth and mistings, and increasing cage ventilation.The pool depth was increased to 8 cm, the lights were dimmed, and a misting system and humidifier were added to simulate rain storms that are the catalyst for natural tomato frog reproduction. By the next morning, the males had begun calling and amplexing the females. Tomato frogs breed in February to March following heavy rainfall; the sounds of males calling to attract females can be heard around small water bodies in the dark Malagasy night . Following copulation, females will lay a clutch of 1,000 to 15,000 eggs on the surface of the water . Tadpoles hatch from these small black and white eggs about 36 hours later ; they are only around six millimetres long and feed by filter-feeding . Tadpoles undergo metamorphosis into yellow juveniles and this stage is completed around 45 days after the eggs were laid. Ambushing potential prey, adult tomato frogs feed on small invertebrates. When threatened, these frogs can inflate themselves, giving the appearance of greater size.